Hello there! 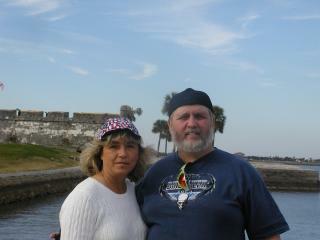 Fred 'n Karen here from Vermont. Glad ya stopped by for a peek!, Right now, we're just getting into chickens, might have a brood 'er two someday, but for now, we have 6 Orpingtons. A roo named "Blue" and 5 pullets, "Bossy, Pearl, Alegra, Buff 1 and Buff 2. We got our first egg on 9/16/09 from Bossy. Buff 1 started 9/30/09, so I guess we're on our way! We also have a Husky / Akita named Sara, and a cat named Clover. All she does is hiss at the chickens, Sara knows better, and we're having a ball with 'em! The pics are on the next page,,,,,,,,,I hope! 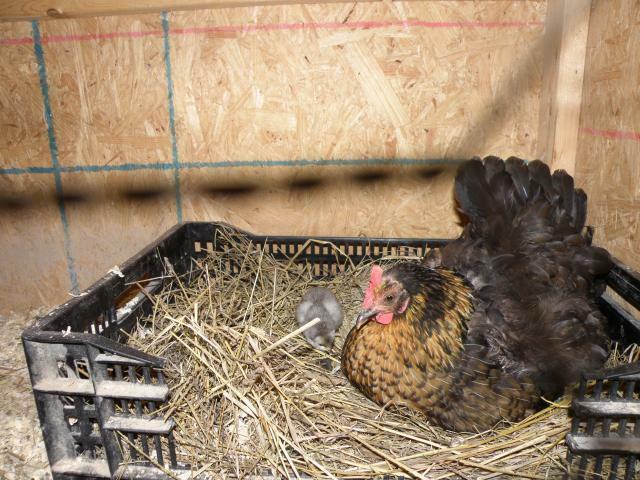 Update 11/14/10 - We have seen everyone start laying, including "bossy" the lone survivor of the predator problem. She'll pop out an egg every now and then, usually every other day or two. The new pulletts (including her baby) are laying daily. One has a problem with the nest boxes in the coop, so she waits for mother to let them out when she comes home, or she escapes, and runs, literally runs to the doghouse and lays her egg. Sara, our husky - akita naturally has to let "Mom" know what's happened in her house. Funny actually. Alls normal again. I had to dispatch two roos, we had 3 total, and they were a bad bunch, gangrapers. Killed one of our pulletts, suffocated her in the coops sawdust so they had to go. We still have 'ol Blue. He's still the best rooster I've ever seen or heard about. Later. Update - 5/14/11 - Sadly, about a month ago, "ol Blue overshot his landing in the coop, when he was impatient for the girls to come to bed. He slammed the wall by the waterer and broke his neck, so we had to get another roo. This one's no where near the calibre of Blue, but,,,,,,,he's young, hopefully he'll catch on. I think he's learning though, we had another new chick arrive. No pics though, guess I'm getting lazy.